I was going to write something about my anger at comic convention exclusives when I saw one that I had to talk about individually. 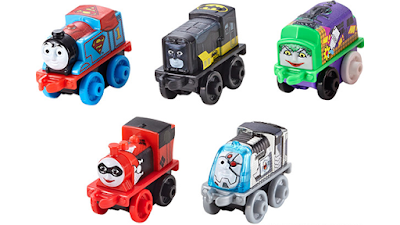 Mattel and DC comics have decided to cross DC’s superheroes with Thomas the Tank Engine. Once you see the pictures you’ll wonder why they decided to do this because the results are terrifying. The five piece set includes Superman, Batman, Joker, Harley Quinn, and Cyborg. As the father of a 3 year old there are a lot of trains on my television. Dinosaur Train and Chugginton are the ones we usually watch. My son has seen Thomas, but thankfully he’s bored by it. I say thankfully because the show is like watching paint dry and those trains are creepy looking. The DC mash up somehow makes them look even scarier. I thought Joker was the scariest looking until I really focused on Batman. It looks like someone put a bloated Michael Keaton into a trash compactor and then glued him to the front of a train. If you’re interested in these nightmares on wheels you can check out mattycollector.com for details.